Learn more about the benefits of our brand-new Email Quality Check feature and how to get the most of it to improve your Reply campaigns. The Email quality check service is the AI-based feature that helps you to create email templates with higher chances to get a response. The service works everywhere in Reply where you can create or edit email templates. Simply begin typing or paste the text into the editor. 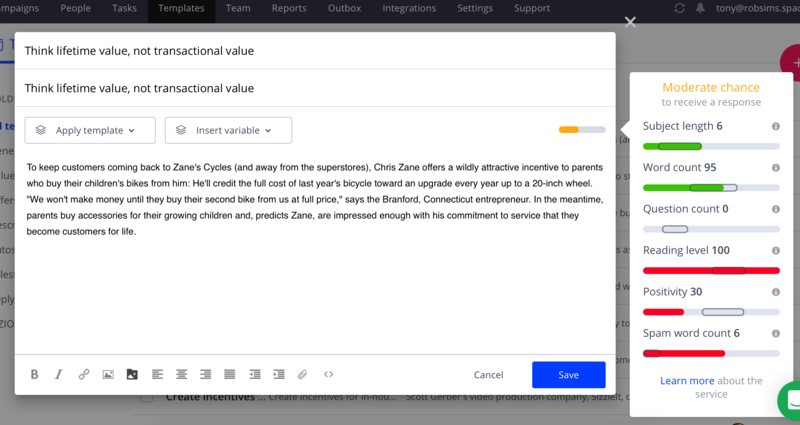 In a second you pause typing, the service analyzes your text and sends back the results based on five metrics - Subject length, Word count, Question count, Reading level, Positivity. The combination of these metrics provides the overall recommendation, for example, High chance to receive a response. Each metric has an optimal interval. Sticking to optimal intervals improves the reply rate. For example, the optimal interval for the Word count metric is between 59 and 111 words. This means that too long or too short emails will be probably ignored by a recipient. Note: the service does not analyze the text that exceeds 1000 characters. No one reads long emails. The service is enabled by default. To turn off Email quality check, navigate to Settings - Tools - Email quality check. Keep subject lines short and personal. More often, emails are being opened on mobile devices where longer subject lines are cut off. Subject lines with 2-6 words are the most effective (follow-up emails can have 0 word subjects). If your goal is to increase replies, construct emails that are 59-111 words. Create emails that appear as though you wrote the email (manually) for one particular recipient. Keep your email short and sweet; don’t send long advertising or sales copies - those never got read and are usually ignored. What do you want your recipients to do? Get on a call, sign up for a course, book a demo or, upgrade their account? Your emails need to have a clear purpose. Moreover, if you want to get a response, give the recipient a question to answer; asking 1-2 questions in your email gives you the best chance of getting a response. Always check if your text is easy to read, if the thoughts are presented in a logical and easy to read order. Surprisingly, more complex emails are most likely to get a response. Simpler words and shorter sentences yield a lower reading grade level. Positivity defines your email contains positive or negative connotation. Adding several positive words to your email template improves the reply rate. We calculate this metric based on artificial intelligence to ensure the best results. The Spam word count metric shows how many words, recognized by spam filters as spam words, are used in the text. To improve your reply rate, try not to use them in your emails.